Helical piers may also be known as screw piles. As both “helical” and “screw” imply, this method employs a spiral-shaped head that is literally screwed into the ground using a high-torque hydraulic motor. The screw provides a bearing surface that transfers the load from the structure to the underlying soil or rock bearing strata. The piers are screwed into the ground as needed to provide structural remediation. 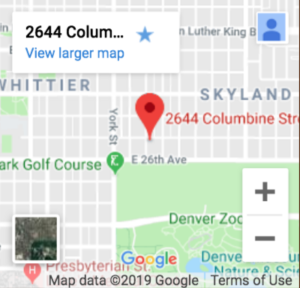 How are helical piers used in the Front Range? Helical piers have a variety of uses, including slope stabilization and structural underpinning. In slope stabilization, the helical pier may be screwed into the slope past the poor soils and attached to a suitable retaining wall to maintain slope stability. 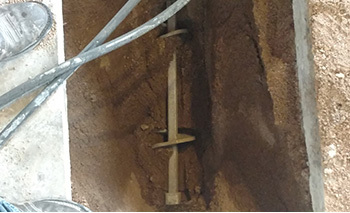 In structural underpinning, the failed footings are exposed and helical piers are placed underneath the failed footings, which are raised to the desired elevation. Footings, building and piers are secured together using a bracket and the foundation is covered. Helical piers are also frequently used in place of a footing or drilled caisson for the construction of a new foundation or even structural slabs. In many areas on the Front Range, soils near the surface can be suspect: either with poor bearing capacity or high swell/shrink potential when wetted/dried. These types of soil are not suitable for building a conventional “footing” type of foundation. Drilled concrete caissons have been used extensively in the past to drill through these layers of soil. This method has had success, but requires very large machinery to drill the caissons, can require casing of the drilled hole, pumping of groundwater and removal of the large amount of soil displaced from drilling the hole, “spoils’ that must be removed using a loader. For additions, pop-tops, decks and many mountain sites, access issues make it very difficult to use drilled caissons. Due to these reasons drilling caissons can be an expensive, messy and damaging part of building a new foundation. The same, or greater strength and stability can be achieved by using helical piers, but it is done with equipment capable of accessing much smaller spaces, creates no drilling ‘spoils’ and causes much less impact on landscaping. 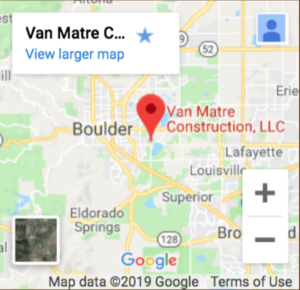 In most cases, we install our piers with a skid-steer or small rubber-tracked excavator. If conditions are too tight for that, a smaller, portable rig can be used to install piers in even smaller spaces. Helical piers also are ready to bear weight as soon as they are installed. The top of the pier is tied into the foundation using one of many ICC Certified connections, transferring the load of the structure and the foundation wall through suspect/unsuitable soil layers down to competent, dense soils or bedrock. Another benefit of helical piers is the need to only coordinate one subcontractor: no more coordinating the caisson truck, pump-truck, concrete truck, and soils engineer. Van Matre Construction provides helical pier installer services directly to home owners, building owners, general contractors and consulting engineers. 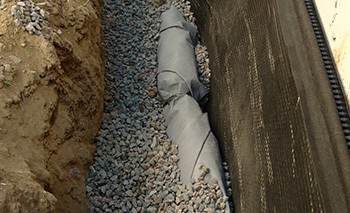 VMC uses a variety of methods to stabilize foundations and return them to level. One of the most effective, efficient, and cost effective methods is with helical piers. Helicals allow us to literally screw through low load bearing or swelling soil near the surface and reach down to competent soil or even bedrock. 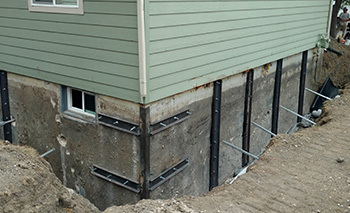 With helicals placed along the edge of a foundation, we can transfer all of the building’s weight onto these deep soil or rock layers, bypassing the upper layers of soil the foundation was originally built on. The limitation of helical piers is typically depth or when rocky soil is encountered. If the soil is expansive but very dense, we have a tough time getting the depth we need to get past any potential swelling layers. Rocks can also stop a helical pier from advancing. In these cases, micro-piling may be necessary. If your windows or doors used to open and close easily and are now tight or rubbing, you could be experiencing foundation movement.